Look#2 is called Day Date. It’s pretty self-explanatory. 🙂 Day date is an occasion where you don’t want to go all out and put a lot of makeup on, because that would just look like you are trying too hard and who knows if another date would follow… just kidding. 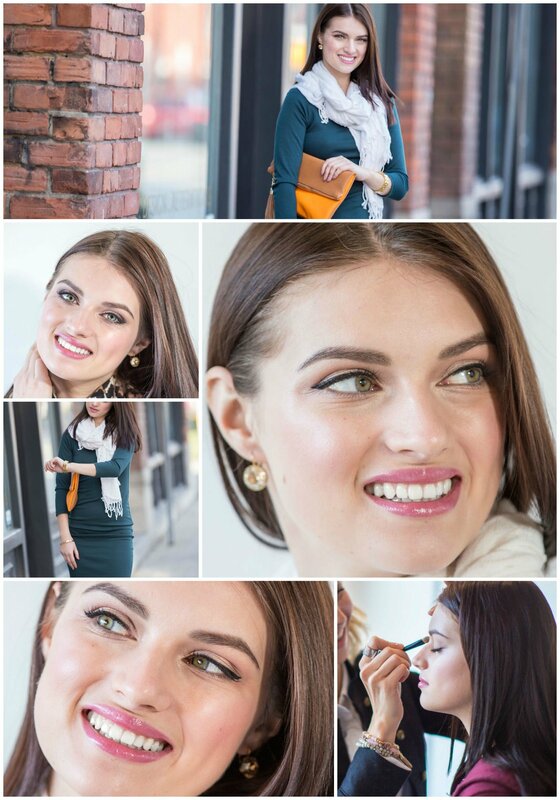 My version of Day Date makeup is fresh and approachable, a natural you with a touch of cute and playful. Save the drama and sexiness for a night time vis-a-vis. 😉 I hope that’s still the case in the world, I’m going on my memory here. I haven’t been on a day date in a few years – babies are not very day date friendly. 🙂 Also, you have to think about the light that you are doing the makeup for – the more natural light, the less makeup. That’s why if you are doing your makeup in the bathroom light it’s very important to do a natural light check before heading out. You just might notice that the blush needs to be blended a bit (or a lot) more. 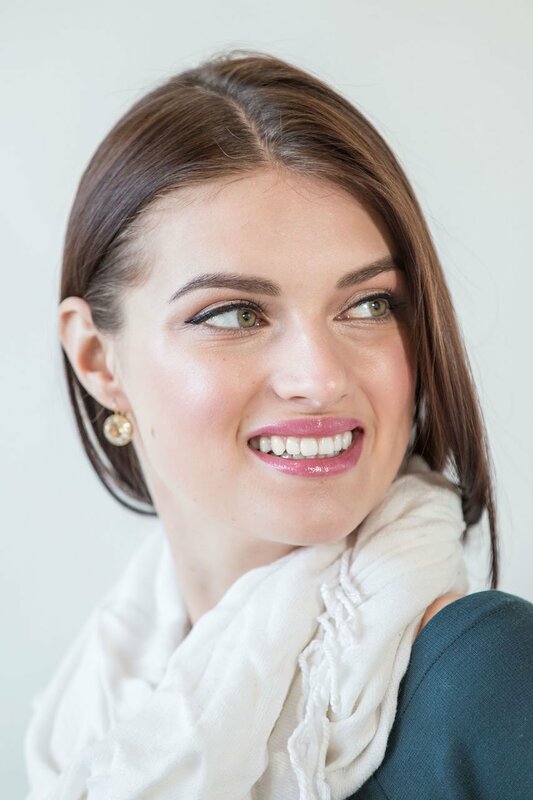 This look is focused on enhancing your natural beauty by defining your eyes with an eyeliner with a small flick on the end, adding a slightly playful feel to makeup, keeping the rest neutral with soft pink glossy lip. It’s amazing what a simple eye-liner can do for the eyes! 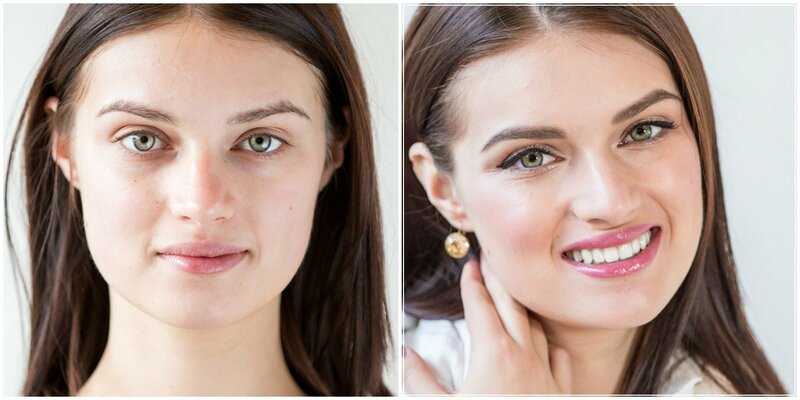 A properly applied eye-liner can make the eyes stand out more and define or even change their shape. I can also teach you how to apply it properly for your eye shape during a Makeup Lesson. I used to never leave the house without my eye-liner on. Now I have really embraced a no liner look (mostly due to laziness and lack of time) and reserve applying liquid liner for a night out. Let’s get to the juicy parts – how to achieve this look. Start with hydrated base. The foundation will go on better and will become one with your skin if it’s freshly moisturized. Always go for the most natural looking foundation, or you can try a BB or CC cream or a tinted moisturizer. The options are endless. Natural light is especially unforgiving to foundation mistakes, that’s why my vote is for the one that looks like your skin. You are just perfecting, not covering it. Use a primer on the eyes to make sure that your liner won’t smudge and stay on well throughout the date. Even the most long-wearing eye-liner will start smudging after coming in contact with skin oils. Everybody is prone to oily eyelids, even people with dry skin. It’s that kind of a place that will always get greasy; hence the dreaded women foe – eye-shadow creasing. Swipe a light colour eye-shadow with a bit of shimmer to brighten the eyes and set the primer even more. Curl your lashes. Now you are ready for the eye-liner, which has it’s own big technique section below. Put lots of mascara on and groom your brows. Find the pretties light pink shade of lipstick that has a glossy finish to it to make your lips look plump. Finish with putting colour on your cheeks in a soft pink blush that matches your lipstick colour for that really girlie barely there flush. If you haven’t mastered the eyeliner – don’t despair. It’s not easy, especially for certain eye-shapes and it takes practice. It really is all about the practice. Like with everything, the more you do it, the better you become at it. I still much prefer to do an eye-liner on somebody else then on myself. Also, there are different products you can use to do eye-liner. This tip is about the most challenging, but one with the biggest impact – liquid liner. I think I found the most perfect liquid eye-liner out there for now – find out which one in my list of key products below. Find the one that works for you, it might be half of the issue if you are struggling with your liquid liner. A lot depends on what kind of brush it has and how the liquid dries. I usually do the base along the lash line first – a very thin one and try to get as close to the lash line as possible. My pet peeve is when I can see the gap between the lashes and the liner, which draws attention to the poor eye-makeup execution, instead of the eye. I was never able to do the line in one beautiful swoop. It’s much easier to draw in short strokes holding and pressing the liner so that you are using almost the side of it, not the very tip. Now draw the flick starting from the outer corner aiming towards the temples. To find a perfect angle of the flick imagine as if you were lining the bottom lash line and extending it pass the outer corner in it’s natural trajectory. I hope that makes sense. This angle will give you just the right amount of flick upwards without making it look too retro but giving a nice lift to the eye. 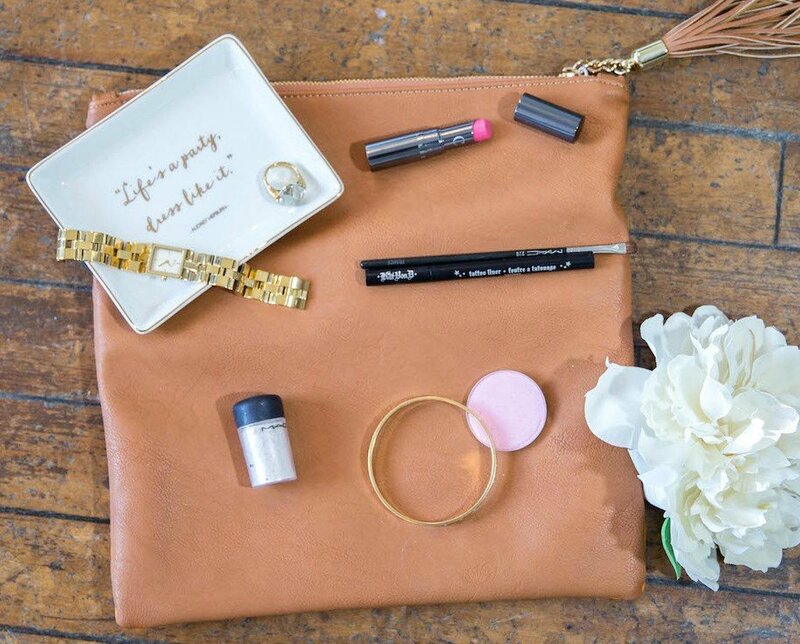 That’s the part that adds that playful element to the Day Date look. Do start with the eye that’s harder for you to do, because it’s easier to match your stronger eye. For example, I’m right-handed, so it’s harder for me to do my left eye, so I start with this one. When matching the flick on the other side, tilt your head back slightly looking straight in the mirror – this way you will see the angle of your liner better. After you have the base of the liner and the flick, go over the top to build a desired thickness, which in this case is not very much. I started the liner just shy of the inner corner not to make it too dramatic looking and thickened gradually towards the end. Whew, you are done! You can have a glass of wine now (helpful to calm the nerves before a date and congratulate yourself on the eye-liner job well done). A few other helpful tips: keep your hand leaning on something for better balance and to control the shakiness and blink in between the eyeliner strokes to avoid blinking right as you are doing it. With liquid liner you have to work a bit faster because if you do too many back and forth the first layers might start to lift and crumble. I will also be posting a short video of this technique on my Instagram @KlavaZ.makeup. MAC Vanilla pigment. Probably one of the most used pigment by makeup artists. A pigment is a concentrated loose colour powder that can be used for a wash of colour or a more intense look, especially if used damp. This is an ivory white colour with a soft golden sheen. It’s also one of those multi-tasking products that can be used anywhere. Looks pretty as a highlighter on cheeks or mixed in the foundation for a more radiant finish or mixed in the lipgloss for extra sparkle. Chantecaille Lip Chic in Primrose. My idea of a perfect soft cool tone pink that’s not too pale. This is a youthful light pink rose colour with a shiny gloss-like finish that doesn’t feel sticky. I love the fact that it is infused with collagen making the looks appear plumper and smoother and has no parabens (always a plus in my books). The colour intensity is medium and feels lightweight and soft on the lips. Kat Von D Tatto Liner. This is my Holy Grail of liquid liners and I have tried many! It has the smartest brush tip shaped like a felt tip but with much more flexibility. Just the right amount of springy flexibility so that it draws exactly where you want it, instead of flopping around or being too stiff. The bristles come together into a very sharp point for those thin precise lines. On top of a brilliant brush design it is highly pigmented and has a long wear formula that is waterproof and transfer-resistant. Usually no liner can stand unsmudged against my very oily skin by mid day, but this one stayed on all day and only started to show signs of transfer by the end of it. The formula glides on smooth and dries fast. MAC Brush #228. A mini shader that is perfect for more precise eye-shadow work or for those with smaller eyes. It’s small, flat dome-shaped brush that is fairly firm with a rounded edge. I actually used it to apply and smudge the powder eye-liner in the night time version of this look. It’s great for lower lash line smokey eye-liner application. MAC Well Dressed Blush. It is described on MAC website as an Immaculate Pink. It has a very soft pink cool tone colour with a slight satin finish and looks like you have been kissed by a pink fluffy cloud. It’s a great blush for fair skin toned but might be too subtle on somebody darker. The texture is smooth and blends nicely. Say your date went longer then anticipated (which is generally a good thing) or you are going out with girls after (to share the details of the day) and you are now in the evening territory. All you need to have with you is a dark grey eyeshadow and a brush to get yourself ready for darker lighting with a bit more oomph on the eyes. Go over the top liner with a small brush dipped in a darker shadow making it thicker and smoky. Line the bottom lash line also smudging the liner as you go along. Finish by blending a bit of the same colour in the outer corner crease in a classic V shape about one third of the way into the crease. This soft smokiness around the eyes adds instant sexiness and mystery. Just don’t go too heavy so that your makeup looks drastically different. One other important thing – smile. Goes a long way on a date or anywhere, really. Audrey Hepburn knew what she was talking about saying that happy girls are the prettiest! Let me know how it goes with this makeup look! You can post your version of Day Date Look #2 here or on Instagram with a tag #EffortlessbyKlavaZ. I would love to see how you did it! And don’t be shy to ask questions! I also do private lessons and group masterclasses, so if you are in Ottawa and would like to become a pro at your own makeup, check out my Educating page. Come back next week and get inspired by the next look in my Beauty Series! And in the meantime, follow me on Instagram @KlavaZ.makeup and Facebook Klava Zykova Makeup Artist and Educator for everyday makeup inspiration.